System compatibility doesn’t get much better than this. Companies rely on their ERP systems to do a lot — but they can’t do it all. Esker solution integration capabilities allow you to automate your O2C and P2P processes directly in your Oracle® JD Edwards EnterpriseOne ERP solution, resulting in greater process efficiency and productivity across every phase of business operations. Now fully integrated with Oracle’s JD Edwards EnterpriseOne software, Esker’s Accounts Payable automation solution allows users of these financial applications to address the manual gaps in their process and easily switch to paperless invoice processing. Welcome to greater efficiency and productivity across every phase of vendor invoicing. 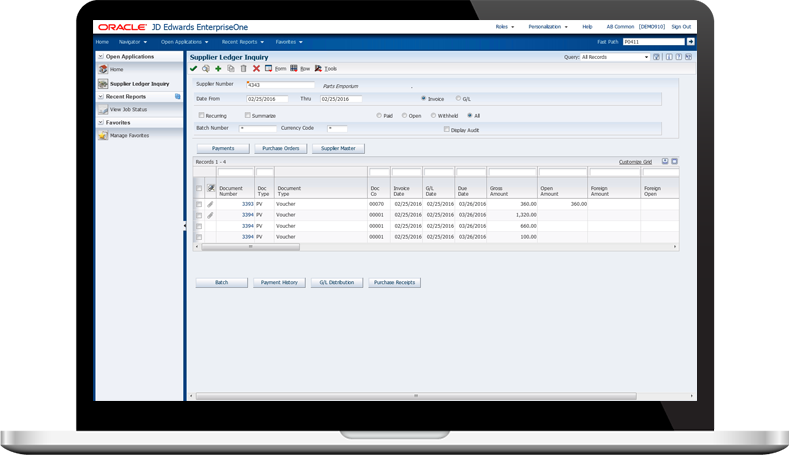 Receive and track AP invoices directly in any JD Edwards EnterpriseOne environment. With Esker, supplier and invoice data are automatically synchronised to support full AP process automation. PO and non-PO invoices are processed within a workflow and automatically archived on a web portal and linked back into the Oracle JD Edwards ERP system where they are available for as long as needed. Invoice data is integrated in Oracle JD Edwards EnterpriseOne system while a copy of the original invoice is attached and available to any authorised user. Automatic supplier and invoice data synchronisation helps leverage JD Edwards EnterpriseOne data to support full AP process automation. AP workflow outside JD Edwards EnterpriseOne delivers better business continuity, 24/7 access, non-JD Edwards EnterpriseOne user approval capability, easier training and greater user acceptance. Invoice archive link in JD Edwards EnterpriseOne enables users to conveniently access the original invoice image and processing data directly from the ERP invoice record. Invoice posting error management so that if an error occurs when the invoice is pushed to JD Edwards EnterpriseOne, the information is made available to the user in Esker's solution. Quick solution setup — communication between Esker’s Accounts Payable solution and JD Edwards EnterpriseOne is fully operational in just a few days. Mobile invoice approval application brings improved efficiency and on-the-road invoice accessibility for managers. PO and non-PO invoice posting are automated and fully auditable. Esker is a gold-level member of the Oracle PartnerNetwork (OPN), providing its customers with the assurance of seamless and safe ERP integration and enabling them to further strengthen their business operations. The integration capabilities of Esker’s solutions are built on proven Oracle technology and application program interfaces (APIs), providing customers with a reliable ERP integration and offering IT departments the peace of mind they require during rollouts of new technologies. environment. Be smart. Make the move. Contact Esker today.